The C&O Canal Trust hosted the first participants in its new Canal For All initiative this spring, demonstrating the popularity and promise of the program aimed at building relationships with diverse communities along the C&O Canal. In July, a group of young women from the Community Bridges program in Silver Spring spent the night in Lockhouse 6 as guests of the C&O Canal Trust. They explored the towpath on bikes from the C&O Canal’s Bike Loaner program, took a self-guided hike, and learned about the history of the canal. Community Bridges, which works with 4th-12th graders, empowers girls from diverse backgrounds to become exceptional students, positive leaders, and healthy young women by addressing the developmental needs of immigrant and minority girls and their families living at or below the federal poverty level in Montgomery County, Maryland. 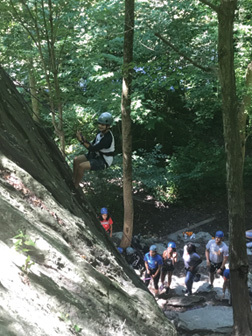 About sixty students from the Watkins Mill High School Summit, organized by the Latin American Youth Center and the Montgomery County YMCA, also participated in the Canal For All program, rock climbing at Carderock and exploring the Billy Goat Trail with Park Rangers in late July and early August. Both organizations work to empower youth with leadership and healthy-living initiatives. The C&O Canal Trust launched the new Canal For All initiative at the beginning of 2017, with the goal of laying the foundation for a sustainable and robust engagement with African American and Latino communities in Montgomery County. Funded by a two-year, $30,000 grant from the National Environmental Education Foundation (NEEF) partnered with the Kendeda Fund, the initiative is working to make programs like Canal Pride and Canal Quarters more relevant and welcoming to diverse audiences. These programs serve as a gateway to engaging community members and bringing them into the fold of canal stewardship. The Trust is developing partnerships with other organizations similar to Community Bridges and the Latin American Youth Center to plan future events that will bring more youth from these communities into the Park. The grant is also covering the translation of Trust materials into Spanish, staff diversity training, and the salary of an intern to help implement the initiative. “This Park is here for all people, and this project expands the community of constituents who care about the canal and who will be its stewards into the next century,” said C&O Canal Trust Director of Programs and Partnerships Becky Curtis. The program is being piloted in Montgomery County with the aim of rolling it out to similar communities along the canal.